Categorized as: Stories on January 21, 2013. 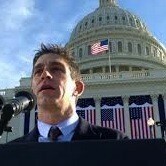 A moment in time: at the 2013 Presidential Inauguration, poet Richard Blanco, the first Latino and openly gay inaugural poet, tracks a ray of sun across the hills and valleys of America, retraces the steps of our ancestors, and maps out a constellation of hope for our future together. The following poem was delivered by Inaugural Poet Richard Blanco during President Obama‘s second inaugural ceremonies Monday. Below is the full poem, as provided by the Presidential Inaugural Committee. Text of poem courtesy of the L.A. Times; photographs courtesy of The White House. Read more of Richard Blanco’s work here.